In the beginning, there was a mass phenomenon of individual spatial takeovers. 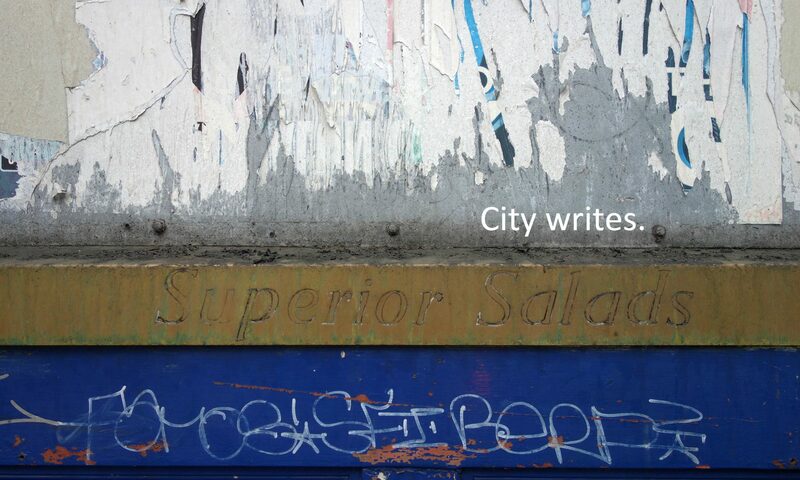 The city as playground and canvas, an affirming and liberating wall writing practice, and the rebellion, engagement and spatial energy that came from it. The joy of the successful initiative to develop a visual language and record it on the almighty city; and the feeling of achievement that came with inscribing oneself in the urban fabric, and becoming of the city. Then, there was local government opposition to these freedoms, the authorities’ claim of a moral jurisdiction over the city and the transport system, a setting out of what was allowed and what would become criminal. The law roused its prerogative to censor unwanted behavior and limit its material traces, while constructing an urban environment which was conducive of certain types of attendance. Public signatures were ousted, and surveillance machines were brought in; writing got confiscated, while cities were gearing up to repel the barbaric graffiti and install the physical and logistical infrastructures that would keep it at bay. In parallel, there came the friendlier, more democratic forms of street art, akin to corporate urban language, close to pop culture and art, yet still defiant of legal conventions of urban display. If a silver throw-up was not meant to be there, then neither was a stencil of superhero Jesus but, since the latter was vaguely relatable, while the former much less so, two distinct camps developed. Street art was separated from graffiti by a non-explicit double standard, Banksy was separated from street art by another, third standard, and the art world stepped in to further protect, promote and commodify the newly-born visual style of the streets. The graffiti vandals and the street artists were already becoming two separate, opposing groups, despite many of their members not wanting to be associated with either club. One was distinctly under the scrutiny of the law, while the other became the darling of the art world, the renegade child whose talents were too cool to pass unnoticed. They didn’t; and so came street art’s dependence on a mechanism of institutional accreditation and endorsement, and on commercial and political support. Here we are, then, in a surface world whose predominant, emerging language is the result of these endorsements, the consequence of maxing out on the ‘art’ in ‘street art’, through the support of local governance, art galleries, tour guides, the internet and printed media. Legal and administrative control is safely maintained, while murals grow as an apex of the creative city, the hip global style that sells tourism and cities as products, but doesn’t allow them to be plurally produced. The claims, encounters and energies we started from have been systematically suppressed and altered, until they transformed into painting permission forms, festival calendars and Instagram-fueled art careers. However, despite the current situation, murals are a fad, and graffiti will endure. As long as there are urban environments, inequalities and opportunities; as long as there is life and interest in cities; and as long as there are even the tiniest windows of expressive freedom – graffiti will endure. Inscriptions have proven their resilience time and again: get rid of them, vilify them, sell them, cut them from their walls, or coopt them into capitalist urban economies – they will find their way out and onto city surfaces, into the liminal spaces of the law, behind unexpected corners, under bridges, back up on buildings and in public view.